School is over. I am now a college senior. I thought if I said it enough, maybe I'd believe it. Mooney Final and Car Ad. DONE WITH MY MOONEY FINAL! PRAISE THE LORD! That was seriously the final I was stressing about the most. I even had a dream about it last night. I dreamt that Dr. Mooney felt super gracious and decided to give us the dates on our timeline and all we had to do was fill in the authors and their works. I told a couple guys in my class about my dream. When we got to class, Dr. Mooney was holding the stack of finals. He begins passing them out, starting at the front of the class. Immediately after Paul gets his, he turns, looks at me, and declares, "Liz, you're a prophet." [Insert excitement here.] "Oh my gosh! My dream came true?" I yelled. "What dream are you talking about, Mousa?" Dr Mooney says. Then it clicks with him as well as the rest of the class who had all received their finals by then. Dr. Mooney was gracious. He gave us some dates, some authors, and some of their works. We just had to fill in the blanks. TOTAL relief. I missed about 4 and a half of them, I think. Whatever. It's over. And I'm relieved. Now I just gotta revise my paper when he gets my rough draft to me! So, I had the most random dream EVER. It honestly makes no sense. I dreamt I was totally hanging out with Obama. There were these big buckets of money—just coins. And I was like, "Let me count them! I bet I can count them super fast and get into the Guinness Book of World Records!" And Obama was like, "I bet I can beat you!" So we both started this crazy race to see who can count coins the fastest. SO WEIRD. On a different note, Wanda is the cutest woman in the whole world! Yvonne and I are totally her buddies! She loves us. Anyways, the other day, she was like, "What size shirts do you girls wear?" So we told her. Today, when we walked into the caf, she was like, "Girls, wait right here." 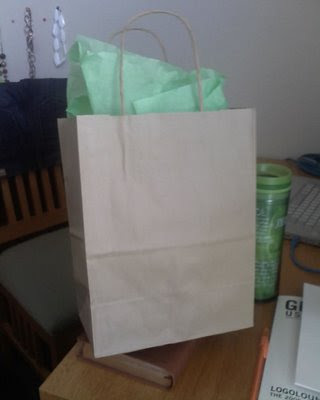 She walks away and comes back with two bags all pretty with tissue paper and everything! She got us Wanda's shirts! She's soooooo cute! I can't believe she gave us gifts! I love Wanda! Photo of us in our Wanda's shirts WITH Wanda coming soon. So, I have previously vented about how Chipotle angered me. Read about it here. Well, I gave them a second chance today. I was reeeeeally craving a lemonade. On top of that, a whole group of my friends were going to Chipotle and said I should come. It took me forever to decide if I was going or not, but then I finally gave in. I get to Chipotle, stand in the terribly long and slow line, finally get to order. Mind you, ALL I wanted was a lemonade. No food. Not after the overpriced guacamole issue. I order a small soda, walk over to the machine, and attempt to get a lemonade. Water comes out. I dump it out and try again, as if that would really do anything. Still, just water. I just ordered it. My Nikkor 55-200mm lens for my Nikon. Man, I am SO stinkin excited! I didn't take enough pictures this semester. I regret that. But I will fix that this summer. You'll see. Geez, I'm gonna carry around way too many cameras everywhere I go. I still need to go on my polaroid shoot. 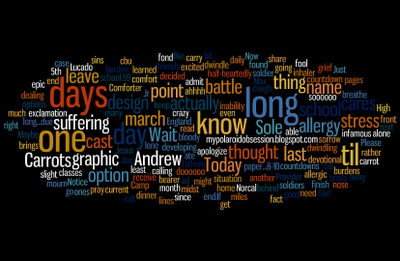 I just wordled my blog. And it made me feel like I talk about Andrew way more than I actually do. Haha. Oh well, I thought it looked pretty. Carrots are the infamous allergy. I thought I was the lone soldier of the carrot war in this world. Then I found out Andrew was allergic to them too! Today, we decided to be brave and march right into the front lines of battle. After all, we do like carrots. At our graphic design dinner, we each ate one. Now, we are dealing with the battle wounds. Andrew is suffering from a crazy cough and a bloody nose, while I am suffering from a developing stomachache and a slight inability to breathe (wishing my allergy inhaler was here at cbu rather than at home 50 miles away). Don't worry. We will survive! We are tough soldiers! Dwindling Stress and Epic Car Ads. Just when I thought the stress was dwindling (who could I fool? stress doesn't dwindle!) I learned that I have yet another paper...8-10 pages long...due next Wednesday! ahhhh! I have soooooo much to doooooo! The only thing I am actually excited about is my car ad for one of my graphic design classes. Wait for it, wait for it. It's going to be epic. 17 days until the last day of school. 59 days til I go up to Norcal to visit Yvonne! 99 days til Jr. High Summer Camp! Notice, the countdown to the last day of school does not have an exclamation point at the end. And that is due to the fact that I cannot fathom actually being able to finish all the work that I have to do before that day. I know I keep venting about school, and for that I apologize. Please pray for me. Thanks friends. mypolaroidobsession.blogspot.com is calling out your name! He is waiting in the midst of the storm. Maybe it's a good thing I am over a month behind on my daily devotional. God totally wanted me to read the March 5th one today. As long as Jesus is one of many options, he is no option. As long as you can carry your burdens alone, you don't need a burden bearer. As long as your situation brings you no grief, you will receive no comfort. And as long as you can take him or leave him, you might as well leave him, because he wont be taken half-heartedly. But when you mourn, when you get to the point of sorrow for your sins, when you admit that you have no other option but to cast all your cares on him, and when there is truly no other name that you can call, then cast all your cares on him, for he is waiting in the midst of the storm. Easter Break is here. But it doesn't really feel like it. I have sooooooo much homework to do. And my rate of productivity is kinda sucky. It took me like two hours to write one paragraph of my OT Theology paper. Ugh. It's almost 2 a.m. and I am too stressed to sleep. Ridiculous, I know. Especially since I have to wake up at 6:45 tomorrow to get ready for work at 8. Bleh. Today was a rough day. This [short] week was a rough week. I donno what I'd do if I didn't have Jesus. and there is nothing on earth I desire besides You. Toe ntertainm yself, thisi showI amt ypingt oday. Getu sedt oit. Lol. Ia ma tadb itf rustrated. Peoplea rea nnoyinga ndI ama lsoa nnyoyedw ithm ygraphicd esignp rojects. Ij ustw annab edonew iths choola lready! Ugh! I sat in a smart car today, and I fell in love. 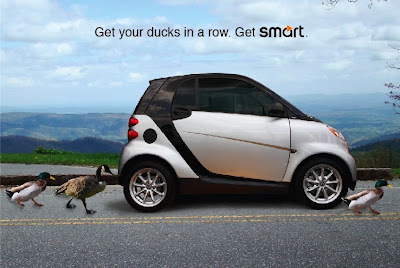 For one of my graphic design classes, we are working on car ads. So today, we went to the Mercedes and Smart Car Dealerships. The day started out really slow. I was half asleep. (Probably because I had to wake up at 6:30 to work spring preview day.) But once we got to the Smart Car dealership, I was wide awake. Those things are adoooorable. Mike had me get in one and I gladly agreed. Then Trever shot a bunch of shots. I CANNOT wait to get ahold of those! They are totally gonna be facebooked! Pretty much, after sitting in that car, I did not want to get out! Those cars were made for people my size! I want one! Anyways, that made my day.